Simon Pearce glassware is still produced using traditional skills and methods developed by old European glass studios. Master glassblowers create one piece at a time, and each is hand-finished to give that item its own distinctive character. Due to their hand-crafted origins, sizes and styling details may vary slightly from one glass to another. 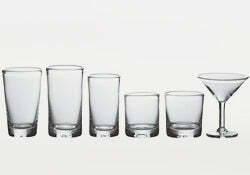 All Simon Pearce glassware is lead-free and made in the USA. Most glasses are safe in the dishwasher, but hand-washing is recommended. Please wash decanters and pitchers by hand.